Your good friends from Ergo Audio here again with a News Update for April 2016. Spring and Summer are right around the corner and it's time to dust off your summer ride and really amp up your mobile audio experience. Just like every year, MECA is preparing for the newest technologies and innovative creations from Audiophiles, and car audio fanatics just like you. We're very excited to see what's in the makings this year and what to look for in the future. New concepts and original ideas are never scarce. MECA is the Mobile Electronics Competition Association, a club and contest organization. "We have car shows with music, fair and fun contests for people who love cars and trucks and the mobile electronics, and bling, that are used to customize our rides. Competive car/truck/motorcycle exhibitions with our Show & Shine score sheet are offered at most events. Our Sound Quality League and Sound Pressure League contests are designed for all levels of competitors, beginner to advanced professional. Ride the Light specialty lighting contests are great night-time events. MECA Kids is our bass music contest using powerwheels toys with our MECA Kids operating the audio systems." Ergo Audio is now a proud dealer of XKGlow! XKGlow is well known for being the leading Manufacturer and Innovator of LED products in the Transportation Industry. 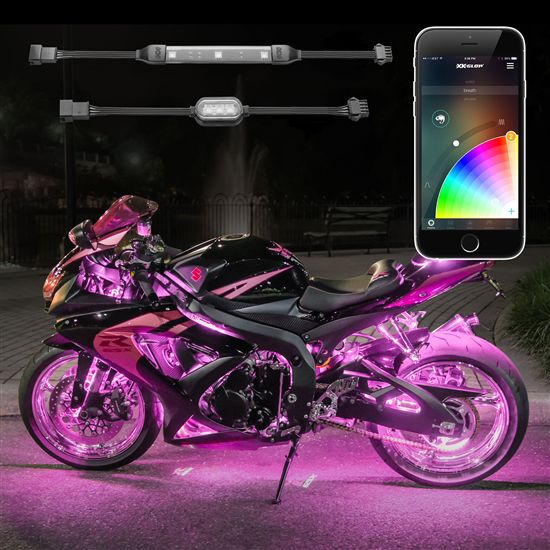 As an LED equipment manufacturer, our company has been extremely proud to provide the most comprehensive LED product line to the automotive, motorcycle, and entertainment lighting industry for more than a decade! And Ergo Audio is offering light packages including the XKChrome! XKChrome is an Advanced App for your smartphone or other device that controls your lights. Changing color, sync patterns with music and many other features! Ergo Audio would also like to welcome Origin Acoustics as a new Home A/V partner as well! Ken and Ed became the largest manufacturers in the world of in-wall and in-ceiling speakers producing them for Sonance, JBL, Bang & Olufsen, SpeakerCraft, Niles Audio and many others. Ken retired in 1988. Jeremy Burkhardt joined the company in 1990 and introduced the SpeakerCraft brand to the world. This brand set a new standard for what could be expected from speakers that virtually disappear into the décor. SpeakerCraft became one of the most innovative manufacturers in the industry. In 2012 the three prior CEO’s of SpeakerCraft Ken, Ed and Jeremy started inventing together again. The three partners have reunited under the all too appropriate moniker, Origin Acoustics. Yes, the originals are back. They have returned to invent and create the worlds best sounding loudspeakers. Bringing an aggregate of over 100 years of experience to this effort, they are designing, developing and innovating new products and technologies that are sure to set the industry standard once again. For a limited time recieve $25 off any remote start when you show us that you like our Facebook page!